Murphy’s Law introduces us to the spunky, 19th-century Irish heroine: Molly Murphy. Defending herself from the unwelcome advances of a landowner’s son in Ireland, Molly accidentally kills him and flees to London to escape hanging. A split second decision introduces Molly to Kathleen O’Connor, who, with her two small children, has tickets on a ship to America, where she plans to join her husband. But after discovering she has tuberculosis, Kathleen persuades the desperate Molly to take her children to America. On board the ship, Molly attracts the loud attentions of a crude, boisterous type named O’Malley. 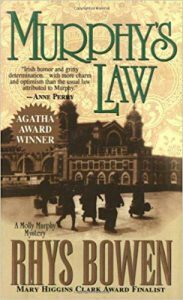 Her public argument with him comes back to haunt her when he is found murdered on Ellis Island; Molly and a young man she befriended become prime suspects. Although the handsome young detective investigating the case, Daniel Sullivan, appears to believe Molly is innocent, Molly decides she’d better investigate on her own behalf and that of her friend. Wending her way through a gritty, pulsating underworld of recently arrived immigrants in Tammany Hall-era New York, Molly struggles to prove her innocence by any means necessary. I also love this series! I often recommend it to patrons. I have read her other ones, but this one is definitely my favorite!